Several months ago I started getting sharp stabbing pains down my shoulder blades. My neck would be tight with discomfort along the shoulder down my upper arm. The worst pain was when the spasm would stab down into the blade itself. Typically it would happen on the right side, only to be relieved by an adjustment from my chiropractor. The adjustments helped for a week to a month. On my last visit he asked me to get a kettlebell and start doing 3 different exercises. Kettlebell? At first I told him I didn’t even know what one was until I remembered playing with one in a Walmart with a friend wondering why anyone would get one. One thing you will learn is that I have the highest possible opinion of my chiropractor. He is far more than that to me. He is a brilliant nutritionist and the most read and current mind I know. As I share more you will learn that following his advice has saved me from “depression” pills, trained me to become a runner and inspired me on this entire journey. So when he said do 3 exercises, I went to the store and bought my first kettlebell. Kettlebells are basically a cannon ball with a handle. They were first seen in Russia in the 1700’s. They were used by farmers to help weigh crops. The handle extendes the center of mass beyond the hand allowing ballistic and swinging movements providing grip, wrist, arm and core strengthening. 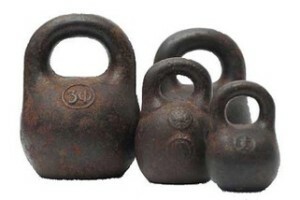 The options for a kettlebell today can be overwhelming. There are the traditional all iron options and then there are handle padded kettlebells with screwable plates to adjust the weight. The lightest I found was a 5 pound baby kettlebell compared to the 55 pound beast I never hope to touch. Prices ranged with the features from $30 to $55 for the 20 pound options. I was warned not to go with too light an option because in the first month I would significantly increase my strength. Having done some minimal training in my past I also did not want to get anything too heavy because lack of control leads to lack of form and injury. Also, my upper body is scary weak, something I have needed to change for years. Although the 20 pound is probably where I should be with one handed exercises I knew I would not be able to do even a single repetition. So, knowing that I was probably throwing away money, I got a cheap 10 pound kettlebell for the single arm exercises and a padded 20 pound for the two arm exercises. Two more quick points from my initial research. Two major reasearch studies were conducted using the kettlebell. One at the University of Wisconsin in 2010 (full report) and the second at the University of San Jose in 2011 (full report). These studies showed a measurable increase in soccer and la crosse players stamina, oxygen levels, core strength, flexibility and endurance. Although weight loss was not measurable, one wouldn’t anticipate this aspect in fit college players. For me the need was not to increase my capacity to top form, this tool was about strengthening my arms and shoulders to stop the pain. I will share more about the three exercises and let you know how they helped in the next few weeks. Next time I will share the three exercises and my first experience with them.